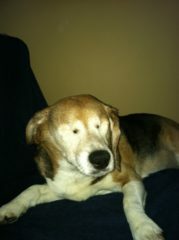 For some pets, adjusting to blindness can take time. When a pet loses vision gradually, there is an opportunity to map out the environment and learn to rely on other senses gradually. But with sudden vision loss, adapting can be more difficult at first. Cleo was rescued when she was 5 years old and spent many of her weekends with her adopted family participating in charity dog walks. Unfortunately for Cleo, the genes for glaucoma (high pressure inside the eye) ran in her Beagle family and at 11 years of age, the pressures rose inside her left eye. When she lost vision in that eye and the pressures could no longer be treated with medications, the eye was removed to make her more comfortable. 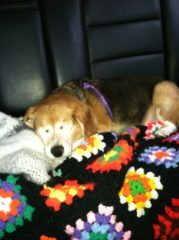 She made a swift recovery, and her family noted that that loss of vision in one eye did not seem to affect her at all. But then several months later, Cleo was suddenly confused and started bumping into furniture and walls. The pressure had risen sharply in her remaining eye, causing her to lose vision completely. Medications were attempted, but nothing seemed to bring the pressure down. Now her family faced a more difficult decision. 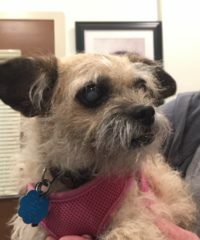 They knew rationally that the remaining eye was useless to her and that the surgery would make her comfortable, but imagining your pet without eyes can be a difficult hurdle to overcome. Deciding to move forward with enucleation of both eyes can be particularly challenging because society expects pets (and people) to have two eyes. 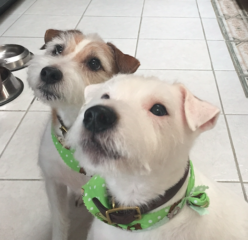 Friends who do not know your pet as a family member might have a hard time empathizing with the surgical decision. Cleo’s family was not prepared to lose her and knew that surgery was their only option to end the discomfort. They decided to move forward but as Cleo recovered from her second surgery, she seemed to struggle. The depression and hesitancy that occurred with her vision loss did not seem to improve, even after her incision had healed completely and pain was no longer a concern. Her family started to question their decision and anguished as she bumped into furniture or panted anxiously. They tried everything they could to engage her and make her happy again. And then two weeks after her surgery, a switch flipped. Her family arrived home from work to find Cleo barking, wagging her tail, and bouncing up and down. We will never know what made the difference for Cleo and why the change was so sudden. But after that day, Cleo navigated up and down her two-story deck, wove between tight squeezes in the furniture, and curled up her her favorite spot for every nap. She lived for five more happy years, and never again was there a day of regret.